An app which can take an electrocardiogram on horses using a mobile phone has been proven to deliver clinically useful information. A team of professors from the Faculty of Veterinary Medicine of the CEU Cardenal Herrera University in Spain have publicised the findings of a study which validates the app. Their findings have been reported at the annual congress of the European College of Equine Internal Medicine in Ghent, Belgium. The study, conducted by CEU UCH professors Ignacio Corradini, Javier Enguel, Alicia Fernández and Marta Barba, will soon be published in an international scientific journal. Corradini, head researcher of the study, said apps to monitor people’s health are becoming more common, and they have growing uses in the field of veterinary medicine. “With this research, we have shown that telemedicine and mobile phone apps can now also be used as tools for monitoring the health of horses and conduct a key diagnostic test such as an electrocardiogram. 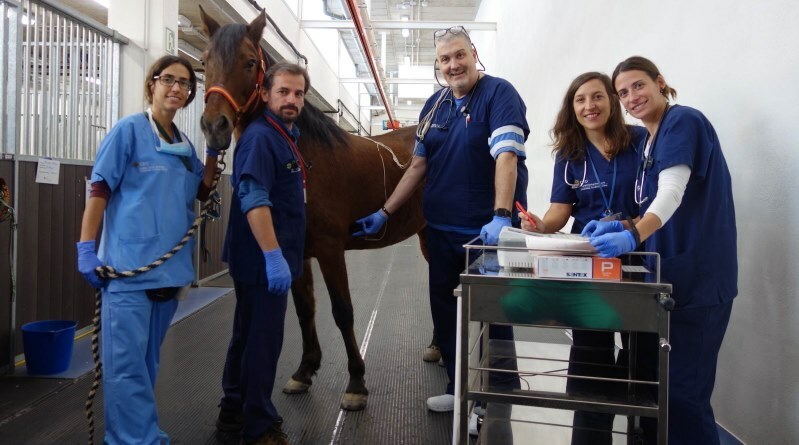 In the study, the professors in the university Clinical Veterinarian Hospital, evaluated the accuracy of the app on both sides of the thorax to detect arrhythmias on a total 50 horses, with and without prior arrhythmias. “The results have been excellent: The mobile phone has shown high sensitivity for detecting and characterising the cardiac arrhythmias of horses,” Corradini says. The app will enable veterinarians to add the electrocardiogram as a common test during a routine check-up. The study also concludes that the mobile phone-based electrocardiogram, due to its limitations, should not completely replace the electrocardiogram conducted in a veterinary hospital. “The equipment used in hospitals is more sensitive and would noticeably enhance the initial information provided by the mobile phone electrocardiogram,” he says.